The post 2019: APC Affirms Buhari As Its Presidential Candidate appeared first on Channels Television. The All Progressives Congress (APC) has affirmed President Muhammadu Buhari as its candidate for the 2019 presidential election. 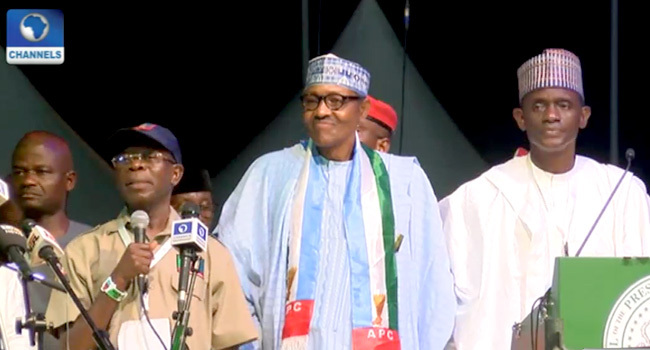 About 7,000 delegates affirmed the President as the party’s flagbearer at the APC’s national convention which was held at the Eagles Square in the nation’s capital Abuja on Saturday. The move comes eight days after the APC held its presidential primary in the 36 states of the federation and the Federal Capital Territory, Abuja. Unlike in 2014 when the APC used an indirect primary to pick its Presidential candidate, the party had opted for the indirect primary this year, allowing all members of the party to play a part in picking candidates. At the convention, it was affirmed that President Buhari who was the sole aspirant in the race got 14,842,072 votes during the primary. Delegates first confirmed that the results from the primary in their respective states before Buhari affirming Buhari’s emergence as the party’s flagbearer. Governor-elect of Ekiti State, Kayode Fayemi, who handled the task of confirming the votes, said because the results from the various states were confirmed at the convention in accordance with the Electoral Act 2010 as amended, “President Muhammadu Buhari, GCFR, is hereby confirmed as the winner of the direct presidential primary of the All Progressives Congress”. In accepting to be the party’s flagbearer, President Buhari thanked all eligible candidates who decided not to challenge him in the primary. He also thanked members of the party for supporting him. He said, “I wish to express my sincere gratitude to the chairmen and members of the convention committee for planning and conducting this convention. The same appreciation goes to the chairmen of national and state executive committees of our party. Thank you very much for doing a difficult job so well. “I will like to pay tribute to Chief Bola Ahmed Tinubu, Chief Bisi Akande, the first chairman of our great party, and Chief John Oyegun who led the party until this year, and all the APC governors. “I thank all other eligible candidates who deferred to me in the interest of our party, unity and overall national stability. Fellow party members, it is with a deep sense of humility that I stand before you today to accept the nomination of our party, the All Progressives Congress to be its candidate and flagbearer in the 2019 presidential election. “As I stand before you, there is no honour greater than the confidence given to me by all of you when you affirmed my nomination. I thank you for your support, I thank you for your guidance, I thank you for being committed to the change agenda.